PORTLAND, Ore. (AP) It seemed random when soccer player Matt Gay showed up at a football kicking clinic at Utah over the summer. 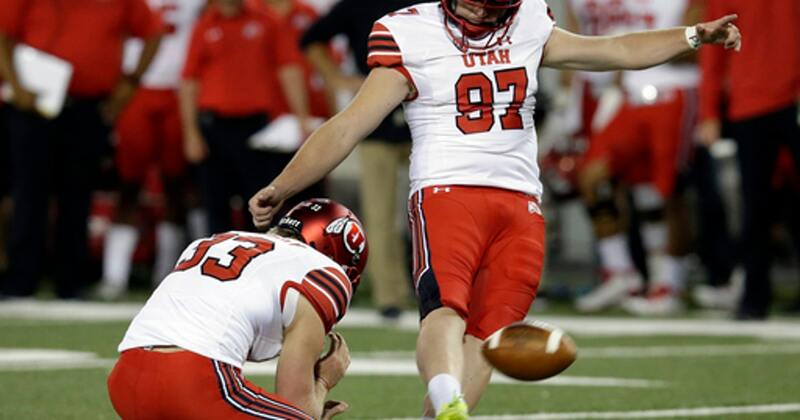 But the Utes have experience in finding their kickers in unexpected ways. Gay hadn’t played football since 2011 when he was in high school in Orem, and even then he only played his senior season. He went on to play soccer for a couple of seasons at Utah Valley University. But he impressed Utah coach Kyle Whittingham and his staff as the team searched to replace Andy Phillips, Utah’s record-setting kicker who booted the game-winner in last year’s 26-24 victory over Indiana in the Foster Farms Bowl. Gay was a walk-on in fall camp. This month he got early word from the NCAA that he’d get an extra year of eligibility next season. When Whittingham announced it to the team during a meeting on the practice field, he called Gay up. Whittingham pointed to a building in the distance, where a banner was unfurled: ”You’re on scholly, Matty” it said, and Gay learned he’d earned a scholarship. He currently leads the NCAA in field goals per game with an average of 2.38. He also is the national leader with 19 total made field goals. He leads the Pac-12 in scoring with 79 points, averaging 9.9 points a game. He’s been a bright spot this season for the Utes, who have lost four straight. Gay’s success for Utah has mirrored that of Phillips, who was a member of the U.S. Ski team and had never played in a football game at any level when he joined the Utes. Phillips played in all of Utah’s 51 games over the past four years, setting school records with 84 field goals made, 100 FG attempts and 427 points scored. Gay has kicked a 56-yard field goal this season, tied for second-longest in the nation behind Arizona’s Lucas Havrisik, who kicked a 57-yard field goal last weekend against Washington State. MY GENERATION: Colorado kicker James Stefanou holds the distinction of being the oldest kicker in the league. The 30-year-old Australian is the second-oldest kicker at the FBS level – three months younger than Derrick Mitchell of Western Michigan. Stefanou was also a soccer player who learned American football at Prokick Australia, an academy that has developed such players as former punters Tom Hornsey of Memphis and Tom Hackett of Utah. Current Utah punter Mitch Wishnowsky is also a product of the school. ”It’s been a unique situation but he’s done really, really well,” coach Mike MacIntyre said. This season Stefanou has made 13 of 15 field goals for the Buffaloes, his longest from 49 yards out. BIG SHOES: Like Gay picked up for a successful predecessor, perhaps no one in the league faced bigger shoes to fill than Arizona State freshman Brandon Ruiz. Ruiz takes over for Zane Gonzalez, who won the Lou Groza award as the nation’s top kicker last season. Now with the Cleveland Browns, Gonzalez holds the NCAA career record for made field goals with 96. Ruiz has made 12 of 16 field goals this season, including a pair from 52 yards. Ruiz has won Pac-12 special teams Player of the Week honors twice this season. CHASE McGRATH: Persistence paid off for USC kicker Chase McGrath, a freshman walk-on who eschewed a scholarship offer from Army to be a Trojan. McGrath grew up in Southern California and was a lifelong USC fan. He went to Mater Dei in Santa Anta, where he hit all but three of his PATs his senior season. Besides the offer from Army, McGrath was offered preferred walk-on status at several schools. But he was determined to be a Trojan. The walk-on kicked the game-winner in double overtime against Texas from 43 yards out. McGrath has made 10 of 13 field goal attempts this season, with all 39 extra point tries. His long for field goals was 51 yards. SENIOR STEADINESS: Washington State’s Erik Powell struggled at times last season, missing a field goal in each of his first five games. Now a senior, he’s made 14 of 17 attempts, and has 78 points for the Cougars, an average of 7.8 per game. LONG FOR LUCAS: Arizona freshman Lucas Havrisik – the team’s backup kicker – was named the Pac-12 special teams player of the week after he kicked a 57-yard field goal against Washington State last weekend. That’s the longest in the nation this season, and it tied a school record held by three previous Wildcats. ALSO NOTABLE: Stanford sophomore Jet Toner was named a Lou Groza award ”Star of the Week” after three field goals for the Cardinal last week against Oregon State. Toner is 15-of-17 on field goal attempts, and his .882 completion percentage ranks him 13th nationwide.